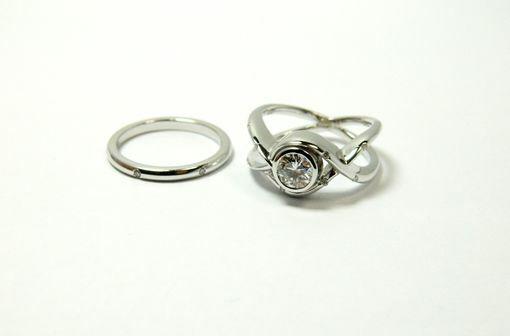 Custom copyrighted designed 18K white gold and burnished diamond wedding set by AKN. Center diamond is .50CT Round SI1GH and the small diamonds are flush set (burnished) in both the band and the engagement in a random patterns. Every maker has a story. Be a part of AKN Designs Ltd's story by placing an order, leaving a review, and seeing your review appear here.